Archaeologic The Sinclair Spectrum made the Acorn Electron inevitable. In June 1982, less than two months after Sinclair had unveiled the Spectrum - which had still not shipped, of course, even though Sinclair had promised the first Spectrums would be in punters’ hands by the end of May - Acorn co-founder Hermann Hauser was heard talking about a rival machine. He candidly told Popular Computing Weekly that Acorn’s next machine would debut in the third quarter of the year, taking the fight straight to the company’s nemesis. Sinclair priced the 48KB Spectrum at £175. 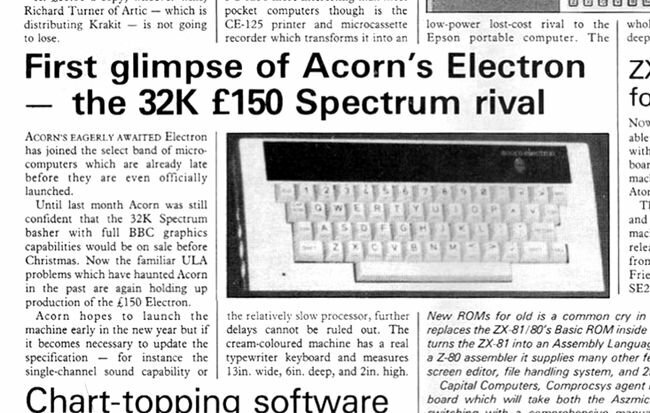 So the 32KB RAM, 32KB ROM new Acorn machine - which “will probably be called the Electron”, the paper reported - would set punters back between £120 and £150, Hauser suggested. And it would offer higher resolution colour graphics than the Sinclair computer too and, crucially, be compatible with BBC Micro software. 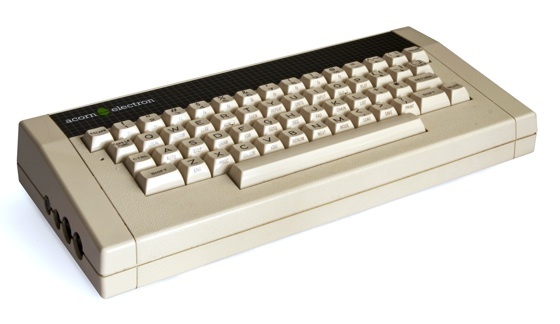 Hauser’s revelation came in response to a question concerning the Spectrum’s potential to undermine sales of Acorn’s cash cow, the BBC Micro, which had gone on sale just six months previously, at the end of 1981, and was actually now more expensive than it had been when it debuted. Hauser, of course, laughed off the suggestion, but his comments suggest Acorn was very aware of booming sales in the lower reaches of the market, a segment the pricey BBC machine, even in its cut-down Model A form, couldn’t reach. As the hints Hauser dropped in June 1982 show, the solution was obvious: produce an even cheaper machine than the BBC Model A that would appeal not only to potential Spectrum buyers but also to people who were drawn to the cachet of the BBC Micro but couldn’t or wouldn’t justify spending up to £399 on a home computer - especially when you could buy a Sinclair machine for less than £100, a Vic-20 for not much more than that or, soon, a Dragon 32 for under £200. Even Acorn’s own Atom was still available, for £150. The Electron, then, would be a “miniaturised” BBC machine in Spectrum clothes - in 1982 it was being reported that the Electron would sport a calculator-style keyboard, and would have single-key Basic command entry - and aimed at the cost-conscious consumer. Steve Furber and his fellow engineers in Acorn’s R&D team were initially less keen on the taking the fight to Sinclair with a cost-engineered ‘BBC Micro Junior’. “We were keener to move forward,” he recalls to The Register. Out went the BBC’s 6845 video controller, memory controller, serial IO control and timer chips, all replicated to a greater or lesser extent by the ULA’s all-in-one circuitry. “We could pretty much fit all the functionality of the Beeb [BBC Micro] into a ULA with the exception of the microprocessor and the memory,” says Furber. He was tasked with designing this custom chip, but it wasn’t the only cost-reducing technology the new machine would feature. By the time work began on the Electron, commodity DRAM had gone from the 16Kbit chips used in the BBC Micro to 64Kbit parts, so another obvious way to make the machine cheaper was to take advantage of this higher density memory. As 1982 drew to a close, Hauser’s original launch window had long since closed yet the Electron seemed no closer to a launch. Pictures of the machine leaked to the press, revealing a machine identical to the one that would finally be revealed in August 1983. Acorn couldn’t keep the new machine’s existence a secret any longer. A company spokesman told Popular Computing Weekly in November 1982 that the new machine was “ready apart from the ULAs” but in any case wouldn’t be made available “until we have built up substantial stocks”. Chris Curry made the same pledge in January 1983. The machine would launch in March 1983 “for sure”, he promised. It was a pledge that would come to haunt the company in the months following the Electron’s debut.